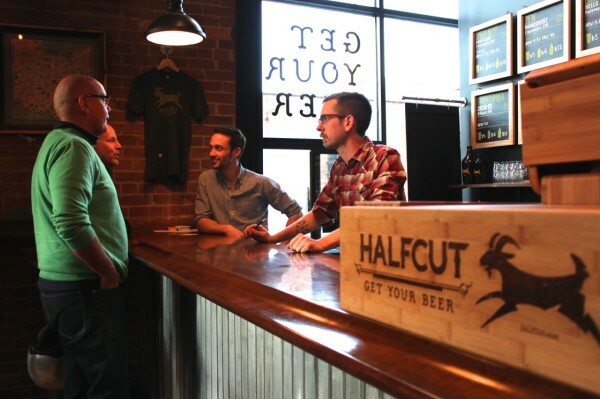 If you’re looking for things to do in Cincinnati and you’re hoping your “things to do” involves a tasty brew, I have a new place for you to try out – HalfCut. 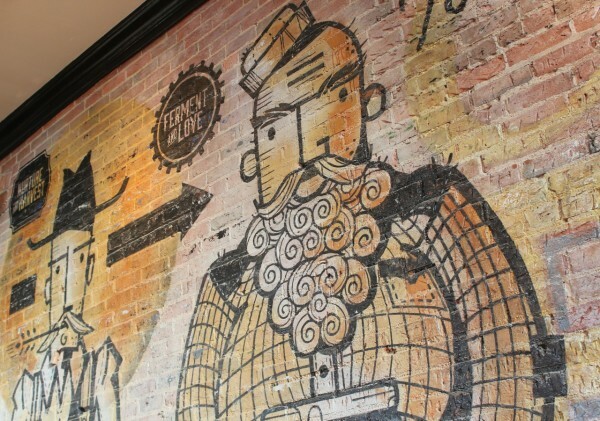 HalfCut is a brand new spot in Over the Rhine, serving up a montage of great craft brews. HalfCut is not your ordinary bar. Borrowing the effective methods of a local deli, HalfCut asks their patrons to form a nice line leading up to the bar. At the bar you’ll be greeted by a knowledgable beer-loving connoisseur who will help you choose the perfect beer for you. The beers are all listed on signs above the bar, along with giant maps of Ohio and the United States. The metal maps have HalfCut goat magnets on display, marking the cities in which the current menu of beers originate. As you approach the bar, you’ll notice they have multiple beers on tap. Each of their draft beers has its own chalkboard sign. On that sign you’ll find a brief intro to what you might expect to get from that particular beer along with its city of origin, the alcohol content, the IBU rank, prices, and a number. The taps, which sit below the signs, are all the same and are simply marked with numbers that correspond to the beer signs above. 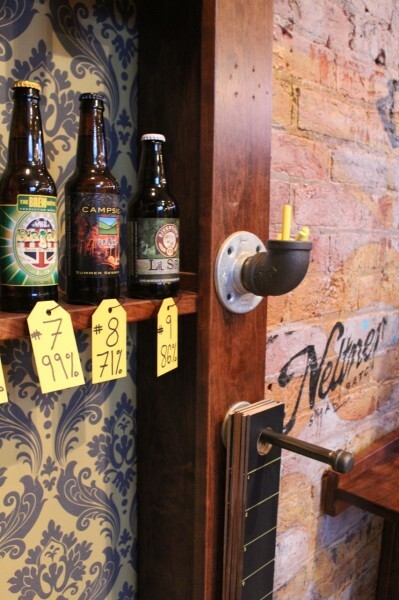 There’s no choosing your favorite by a cool beer tap handle going on at HalfCut! They want you to pick your brew for the brew! You can get your draft craft beer in a number of ways – by the glass or by the growler (both 32 and 64 ouncers). Yep, you can take home a growler of craft beer from Half Cut. You can also get some bottled craft beers, mixing it up with a six pack of your own design. Simply look at the assortment they have on the wall, use the chalk to write down the beers you want, and take it to the bar. They’ll package up a six pack just for you. 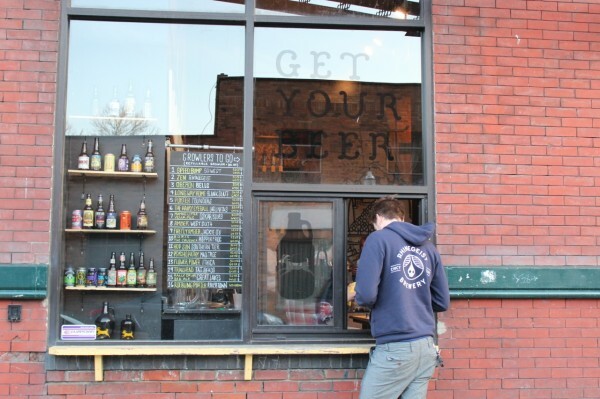 AND if you don’t have the need to go inside, just pop by their walk-up window and order your growler (or bottled beer 6 pack) and take it right home. If you’re sticking around to drink a pint, you can stand up along one long table or you can grab a seat at one of the smaller tables. 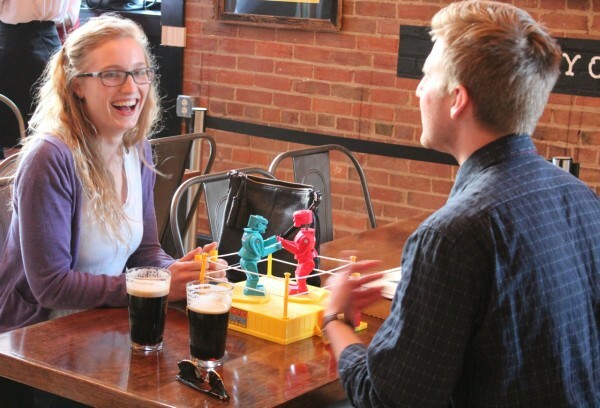 In the corner of the bar you’ll find a great assortment of games to play if you’re hanging out for a while. The space has some pretty amazing artwork, with an entire wall full of custom graphics. The place has an industrial mixed with cool vintage vibe – a boombox hangs as decor on the wall while a turntable spins some vinyl in the back. Bare bulbs hang from looped wires in the ceiling while polished wood provides table space. It will be fun to watch Half Cut’s new bar concepts grow and develop. I believe they are the first to offer the walk-up To Go window and they’re also the first to offer the “deli style” line for the bar. Like that or not (I do like it), you can’t complain about the mix of craft brews and the multiple ways in which you can buy your beer here. I can’t wait to see what they think of next! Sarah – I am really excited to see Gomez Salsa when it opens! I think it’s going to be a great addition to that area. I’m glad to hear the food is awesome too! Gomez Salsa is officially opened and it’s booming. I’d love to see what you think of it if you ever do a review on it! Awesome to find your site! My husband and I just moved here and we have to get to know the city!!! I love places like HalfCut! Ok… will be perusing this site for the rest of the day! !